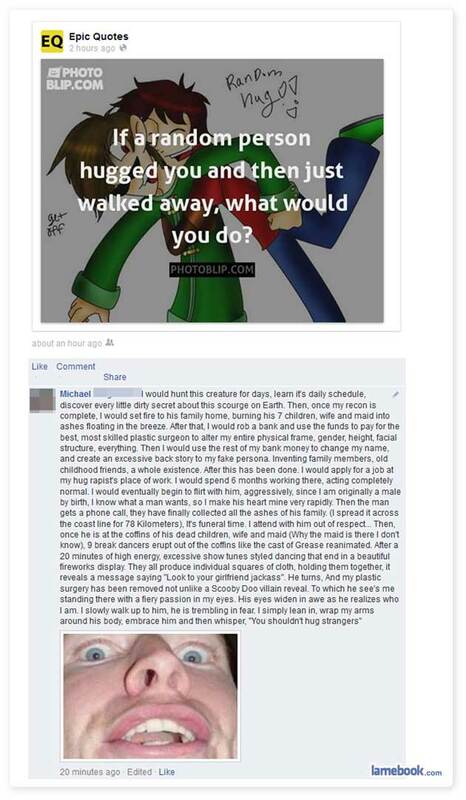 Definitely going to reconsider hugging strangers now. With hugging-habbits like that, it’s his own fault if he gets raped! Pretty sure with a face like that he wouldn’t be most people’s choice for a random hug. No it’s not. It’s not the greatest thing you’ve ever seen. My ‘friends’ and I have a bet called “Big Stranger Rodeo”. The loser of the bet has to pick out the largest fellow in the bar and with no warning or introduction, jump on said large fellow’s back. Being thrown off in less than 8 seconds means you go to another bar and attempt again; ad infinitum. Steeever, what an ugly thing to say… does this mean we’re not friends anymore? You know, Steever, if I thought you weren’t my friend, I just don’t think I could bear it. And why has nobody mentioned King Crimson yet?